Can Jimmy Garoppolo be the franchise quarterback the 49ers are looking for? Quarterback Jimmy Garoppolo is now a member of the San Francisco 49ers having been sent over in a move before the 2017 trade deadline. It seems the NFL has decided to ramp up the intrigue this season with a series of trades before the deadline, but the resolution of the Garoppolo situation is clearly the biggest news. Garoppolo was seen as the heir-apparent in New England, but the Patriots have decided to let him move on, throw all of their eggs once more in the basket of Tom Brady, so let’s take a look at what exactly Garoppolo brings to the 49ers and whether he can be their answer at quarterback. It feels like Garoppolo has been the future for the Patriots for a long time now, but his entire NFL career is just 228 snaps old. Rookie third-round pick C.J. Beathard didn’t start for the 49ers until Week 6, and he’s one lengthy half away from surpassing Garoppolo in total NFL career snaps, that’s how little experience we are talking about. There is a good degree of mop-up duty in those snaps for Garoppolo to with the Patriots offense typically so dominant and multiple games over the past few seasons being out of sight enough to give him a few snaps to end the game, and when you weed out those snaps you’re dealing with even less tape. In reality, Garoppolo’s NFL career consists of 35 snaps in a meaningless Week 17 game against Buffalo as a rookie, and two starts to begin the 2016 season when Brady was suspended, only one of which he made it to the end of. Garoppolo was supposed to get the duration of Brady’s four-game suspension that season to showcase himself as a starter, but he was injured after 42 snaps of the second game against Miami, and Jacoby Brissett started the remaining two and a half games. Add all of that up and you’re talking about what amounts to two full games of NFL play. In only one of those games did he post a PFF grade that was above average, and it was the one that he was injured in – an 86.5 grade against Miami. To put that into some context, we have seen around ten games worth of play from Jacoby Brissett, and four above average PFF grades, four times as much good play as Garoppolo has displayed so far. The key to Garoppolo’s value at the moment is that the good tape is the most recent thing we have seen and he never got the chance to put up any bad to follow it. The second week of the 2016 season is the game that the Garoppolo ceiling is built around. His numbers may have looked good the previous week against Arizona, but 140 of his 264 (53 percent) of his passing yards came after the catch, he fumbled the ball and was generally a little more inaccurate overall. Against Miami, he was almost flawless until he got hurt, hitting on almost everything he attempted and connecting on a couple of big time throws. One of those big time throws showed some high-level read and react skills. He scanned the field to the left before coming all the way back to a seam route from his TE on the other side of the field, putting the ball in the air as soon as he saw it and beating the single-high free safety that he had moved with his first read on the pass. The second big time throw was coincidentally the play that he was injured on – escaping initial pressure to right field and finding a receiver to deliver the pass to and convert on third and long, but he took a hit at the end of the play in the process that ultimately put him out of the game and ended his season. The other area we have to look at for Garoppolo is preseason. He actually has more than twice as much game-time experience in the preseason (545 snaps) as he does regular season playing time at this stage in his career. In grading terms, he has two strong preseasons and two below average, but again, his best tape is his most recent, a positive sign for development. He has completed 67.8 percent of his preseason passes, but has suffered 11 drops and has an adjusted completion percentage of 74.7. 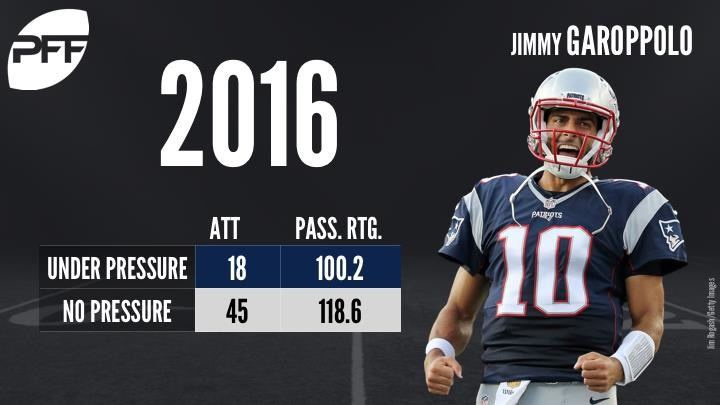 Garoppolo has shown the ability to play very well under pressure. This most recent preseason his passer rating when hurried was just 64.4, but it was just 17 dropbacks. Against the blitz he completed eight of 11 attempts for a passer rating of 127.1 and in the 2016 preseason his passer rating when pressured was the same as it was when he was kept clean, but he had a higher average per attempt. During his brief starting stint in 2016 we also saw some impressive play under pressure, with his passer rating topping 100 and passing for 8.0 yards per attempt on those plays – the exact same total as he passed for when kept clean in the pocket. 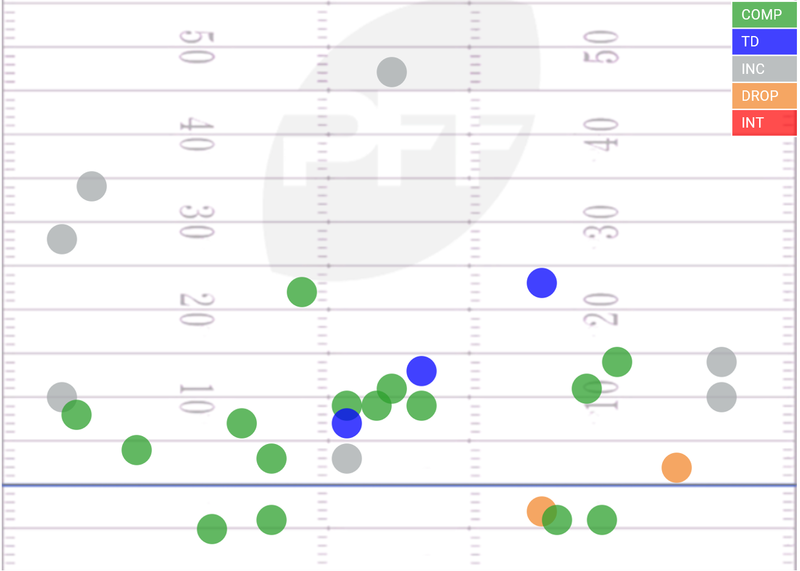 There is no doubt that Garoppolo has flashed big talent during his brief time starting, and he has some impressive tape in the preseason, but there are big asterisks attached to both of those. Preseason is just preseason, where vanilla defenses and poor backups skew performances, and it is often more about not looking bad than it is about looking good. Garoppolo’s preseason performances may be more accurately portrayed as simply not raising an additional red flag rather than an endorsement of his starting credentials. As for his regular season play, while the most recent tape we have of him was spectacular, his entire career has been so short that it is impossible to tell if he is a high-level NFL starter whose audition was cut short due to injury, or if he will be a marginal talent who simply got his best play on tape and then got hurt before he had a chance to put on his worst. If nothing else, Garoppolo represents something at the position the 49ers didn’t have before the move – the hope that they actually have a franchise quarterback now on the roster.